The EPL is the world’s most popular with Premier League matches now beamed to 189 countries and watched in more than a billion homes. 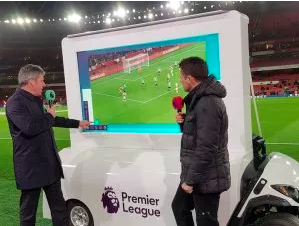 On January 3 2018 the SmartCart SVX mobile touchscreen broadcast system was deployed as part of PLP’s festive broadcast coverage of the Arsenal v Chelsea match. The exciting and hard-fought match – which concluded with a 2-2 score line – took place at the Emirates Stadium, London. SmartCart SVX was operational pitch-side, providing the live on-site presentation, analysis and interviews that are regarded as being crucially important for enhancing fan understanding and engagement. SmartCart has operations in Europe and USA. For more info on SmartCart SVX, contact Gil Cowie at ([email protected]) or visit www.smartcartsvx.com.